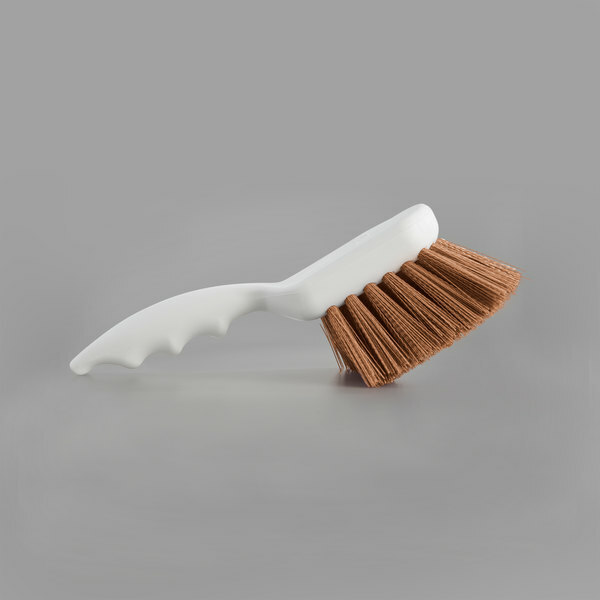 Use this versatile Carlisle 4054125 Sparta Spectrum 8" tan floating clean up / pot scrub brush for a variety of cleaning tasks in your establishment! 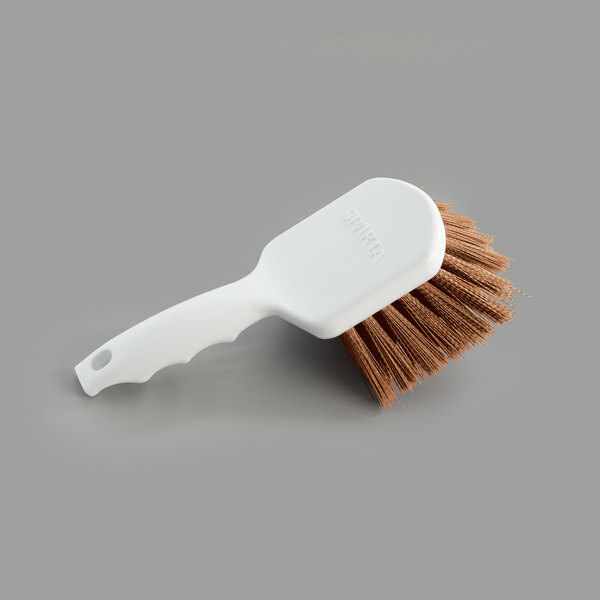 Designed with the end-user in mind, this brush floats on the surface of water, so you don't have to go digging through hot, dirty dishwater to find it! With an ergonomically-shaped, 5" pistol grip handle that is easy to maneuver and provides a sure, comfortable grip even when wet, this versatile scrub brush is sure to become an invaluable cleaning tool in your establishment. Its rugged, staple-set polyester bristles are crimped to better hold cleaning solution and feature multiple trim angles to deliver better surface contact for a more efficient clean, making it a reliable option for your toughest clean-up jobs. 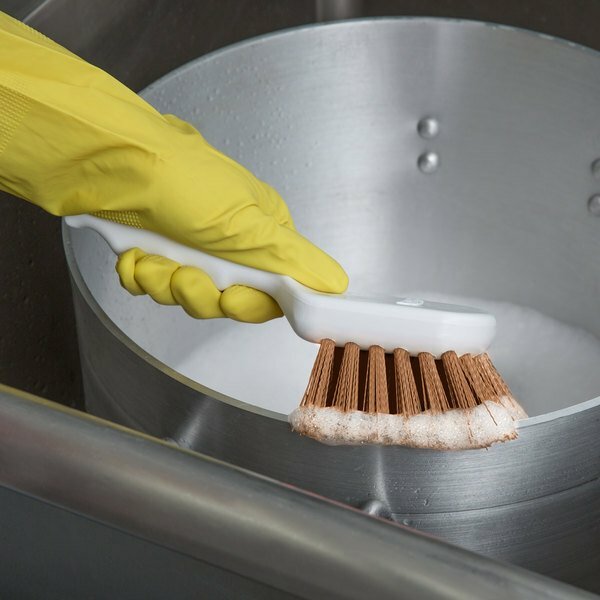 Ideal for removing caked on food and grease off of pots and pans, the brush's bristles can withstand temperatures of up to 125 degrees Fahrenheit, also making it a great tool for cleaning a wide range of commercial kitchen equipment and hard-to-reach areas. The bristles and handle are both made of FDA approved materials, ensuring long-lasting, sanitary use in your commercial environment. When it is not in use, it features a convenient hanging hole on the end of the handle for easy storage and retrieval. 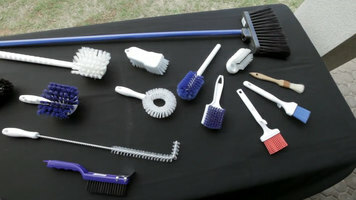 Best of all, the bristles' tan allows you to introduce a color-coded cleaning system, in conjunction with your business's HACCP plan. Designate it for use in a certain area to prevent cross contamination and increase food safety, and use with other Sparta Spectrum colors to take the guesswork out of your establishment's safety initiatives.